The rebels have had a reprieve. The last-minute intervention of an international coalition has degraded Muammar Gaddafi's air capabilities and tanks  perhaps rescuing the opposition capital of Benghazi from imminent recapture by the regime. However, it is still unclear just how well and how quickly the rebels will be able to take advantage of a more level playing field. The rebels seem no more organized or better armed. The only audible advantage is the roar of allied jet fighters in the sky above. 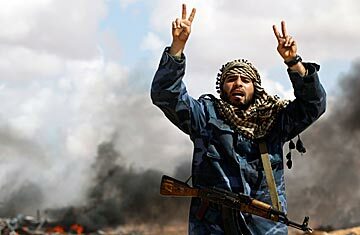 There is still nervousness among the rebels about how securely their hold is on Benghazi. At rebel checkpoints leading into the city, men warned that Gaddafi's snipers were still hiding in the hundreds of unfinished apartment blocks built by a Chinese company. The buildings form a vacant, gray minicity at the edge of Benghazi's southwest entrance. Late on Sunday, explosions shook the city, and at least one 20-minute firefight erupted, making it clear to residents that the much feared government cells allegedly lurking within the rebel capital may still be preparing to strike. The rebels are also unsure of just how far their aerial allies will go to help them as they push west  as they must if they want to oust Gaddafi from his capital Tripoli. The foot soldiers remain largely inexperienced. "We are just civilians. But we fight because we have to," says Salem bin Hamid, 39. He says he's a shepherd. "But now he's a colonel," a man nearby jokes. Even so, many continued to push west on Sunday, only lightly armed, after hearing that Ajdabiyah, 100 miles (160 km) away, was about to fall to rebel control once again. Morale soared. God will protect us, fighters cried as they sped into battle. By early evening, the front line had fallen to some three miles (5 km) north of Ajdabiyah, in a windy stretch of desert just south of a village called Zuweitina. Rebels poured by the truckload toward the front, even as regime tanks opened fire at them from Ajdabiyah's northern gate. Ambulances followed. The road to Ajdabiyah is a testament to the salvation of the rebels. The 100 miles of desert highway have become a smoldering graveyard for the vehicles of war that Gaddafi used to attack Benghazi over the weekend. Dozens of Russian tanks, trucks mounted with Grad missile launchers and civilian cars lie burned and twisted in the grassy fields south of Benghazi and along a vast stretch of desert road. The tables turned, Libyan rebel forces say, after allied air forces launched a coordinated barrage of missiles on Gaddafi's ground positions and air capabilities on Saturday night and early Sunday morning. For the opposition, headquartered in Benghazi, the strikes were a last-minute answer to increasingly desperate prayers, as regime forces had pushed into the city on Friday and Saturday, and it looked like the month-old revolution for Free Libya might collapse once and for all. "Thank you Sarkozy, thank you Obama," shouts Mustafa Abdallah, a 42-year-old taxi driver, picking his way through the wreckage and praising the French and U.S. Presidents. "And thank you David Cameron," someone else pipes in to include the British Prime Minister. "Thank you Qatar!" Gaddafi's forces had laid waste to cars and rebel checkpoints as they pushed swiftly into the city over the weekend. A barrage of artillery smashed windows and brought down walls in the outlying suburbs of al-Gwarshah and Tabalino, and around the University of Garyounis. Hotels evacuated their visitors, and thousands of civilians fled east in trucks stacked with their belongings, as shells crashed in and rumors of government snipers flooded the streets. But by Saturday night Gaddafi's forces were quickly retreating, resetting the front line once again in the ever shifting conflict. And while some of the fighters claimed credit for the tremendous reversal of fortune through their own coordinated action and determination, many others credit French air strikes for saving the day. The work of the French is clearly evident in the debris. Once hulking camouflaged tanks have been torn to pieces by direct hits, their powerful turrets ripped off like toy parts; shards of blackened metal are strewn across wide stretches of roadway. In other places, tanks are intact, seemingly abandoned after government forces fled on foot and in civilian cars. And in the wake of the early-morning retreat, rebels and civilian tourists alike flocked in, searching for scraps and survivors, and using camera phones to snap pictures of a landscape still in flames. As they climbed onto tanks and picked through empty missile boxes, the tone of voice, so recently grim and paranoid, had become victorious. "Hey, photographer, take pictures of us," some cried to foreign journalists, who days before they had accused of exposing their military positions to Gaddafi. They crowed about plans to fight until death. And they talked once more of pushing onward to Sert, Misratah and, finally, Tripoli. But it's the same kind of boasting that the world heard two weeks ago, before the rebels suffered rout after rout and had to fall back on Benghazi. The allies have now bought them more time. But the rebels still need a real army.